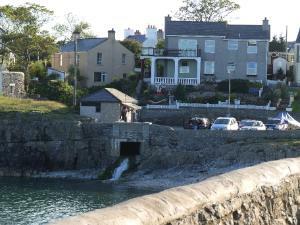 I love coming down to Moelfre's little bay in Summer when the tide’s in. It look and feels like one of those idyllic Greek fishing villages you encounter by happy accident. Yachts and cruisers moor close to the beach and small lobster boats bob up and down on the gentle swell. These are images that fix happy holiday memories to carry you through cold Winter days, dreaming of next Summer. This is a very small bay with an aesthetically acceptable little pebble beach. I challenge you to set up a stable deck chair or lie down to sunbathe without crippling your back on the pebbles. But hang on! 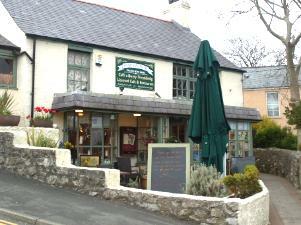 Moelfre is a very, very popular and thriving little visitor village. 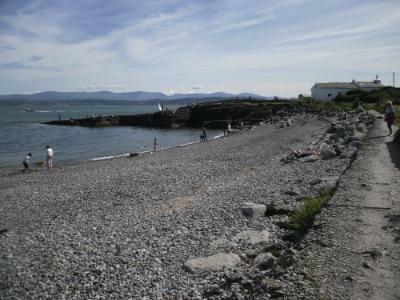 So, it can’t be the beach that bring thousands of people to Moelfre every year. And They Return. It's the coastline, the walks and the maritime history that brings people here. If you must have a sandy beach, then either pack your donkey and head south along the Anglesey Coastal Path to Traeth Bychan or northwards Lligwy. Each about a twenty-twenty-five minute walk either way. 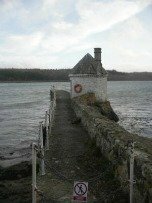 Check the relevant page on www.anglesey-hidden-gem.com for directions if you are travelling by car. On Anglesey, we can offer you the exact beach you want: from golden sands with ice-creams to Winter-thrashed coastlines that only men and women of the RNLI or the odd ferry captain sailing from Holyhead might venture out in. One Holyhead ferry captain earned the moniker 'Hurricane' because he would venture out in all sea conditions. Ireland never felt so far away. It's also the fishing that brings people here to Moelfre. 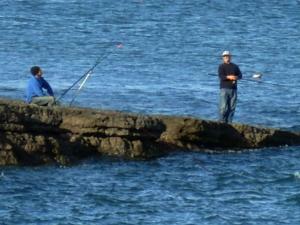 Experts and novices fish by the old lifeboat station and opposite Moelfre Island. The experts amuse themselves watching novices knocking each other on the head with their rods by the Lifeboat rocks. You will find the second beach below just around the corner to the north. People fish off this inclined ledge. I would normally entreat you to take a few steps along the Anglesey Coastal Path because of its abundance of general loveliness. In Moelfre there is no need to do this. The drop down to the beach will engage you in a gentle momentum up the other side of this little bay. Mind you, the smell of fried onions from the car park café or the sight of visitors sinking clear, golden lager at the Kinmel Arms, might render you trapped in the wonderful doldrum between each. Take the obvious path to your right and keep going. The ground before you is green and lovingly maintained. Each meadow is traversed by a mown swathe should you wish to decamp back to the village. I challenge you to resist the urge to move on. Contrasting with the ruggedness of the north west coast, two colours dominate the eastern coastline: Anglesey's beautiful emerald coastline and the vital blueness of sea and sky. N.B. The well-worn shiny rocks and pebbles of the coastal path demand you keep a keen eye on your footfall. The path is low-lying shelved cliffs that can still do serious damage should you tumble. 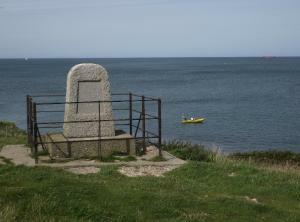 Allow yourself plenty of time to rest and reflect on the courage of local lifeboat men at the viewing bench created to commemorate the Hindlea Rescue. Half a mile further and you can step off the path to view the memorial stone offering commemoration of the Royal Charter Disaster. LLANALLGO CHURCH - No visit to investigate the history of the 'Royal Charter Disaster' would be complete without a visit to the Parish Church of Llanallgo. The church and its then rector, the Reverend Stephen Roose Hughes, displayed a most humane compassion toward the victims that were gathered within the church for identification. It's only a twenty minute trot to Lligwy Beach, were you can rest a while with an ice-cream on either side of the beach. 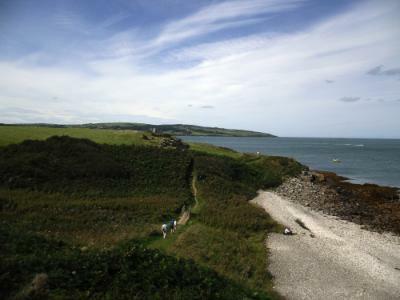 This pleasant coastal stretch from Moelfre northward can be taken at a fair trot or at a more leisurely and appreciative pace. I always choose the latter, as I come here in order to escape. I do not always require the physical mantra of stiff exercise to deflect unpleasant thoughts. Sometimes greater work is done to heal a troubled mind by embracing natural reassuring beauty. Mind you, the effect is greatly enhanced by stormy seas and whipping winds. My heart knows what it wants and, like a good pupil, I just respectfully follow. Late Spring and Summer offer pleasant gentle discoveries for visitors. Less so for those residents who have engaged with the challenge of growing salad in the salty air. Rabbits gather to munch away softly on all such futile endeavour. (Lat. 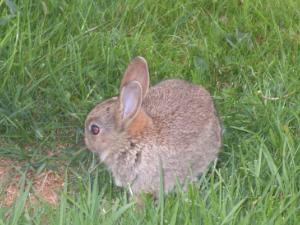 Cutius Ickle Bunnium). It can be a more than usual sweet and lovely evening amble about the village with these visitors abroad. 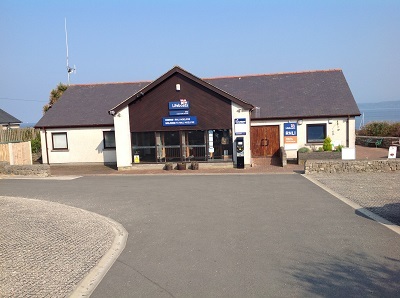 Leave your car down by the beach and trot up the road past the beach will bring you to the RNLI Shop. Some of you may remember it as the Seawatch Centre. The view from the RNLI shop is itself adequate reason to visit; however, the history of this coastline and a retired RNLI lifeboat within is probably the best reason. If you are the type who goes down to the sea in ships, then it might prove to be a good investment to leave a little pecuniary donation in advanced gratitude. You could also follow the obvious path past the old lifeboat station just up from the beach to reach the RNLI shop and also view the new lifeboat station. 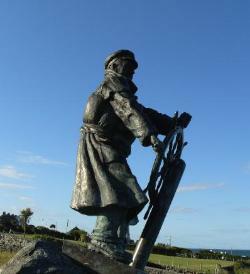 Moelfre RNLI is a permanent exhibition that commemorates and highlights one of Britain’s most famous lifeboat stations. Here you can walk around one of the village's historic lifeboats. Easter to September - Open 7 Days a Week from 10.30am until 4.30pm. If you care to walk two hundred yards along the coastal path then in Summer you can enjoy a tour of the present lifeboat station. Under Dic Evans' leadership the Moelfre Lifeboat pulled off one of the most astonishing rescues of the last century. The Hindlea came to grief a 100 years and a day after The Royal Charter disaster in a 104 mph hurricane in 1859. As with everything to do with the Royal National Lifeboat Institute, it is run by volunteers. So drop a quid into the collection box. Step around the museum and you will discover a marvellous life-size bronze sculpture of Richard Evans. 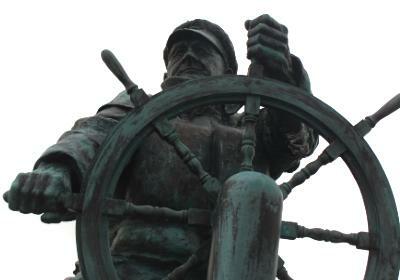 In his Sou’ Wester he is eternally leaning into wind and storm, steering his lifeboat to some unfortunate soul’s rescue. My parents were deeply moved when they first viewed the sculpture with the deeply focussed eyes and stoic character etched into his face. This sculpture not only captures one of our greatest heroes, but offers a sense of these astonishing men and women. Take a moment to pay your respects. A sculpture has been created on the seaward side of the RNLI Centre that will steal away your breath with its stunning, sharp starkness. 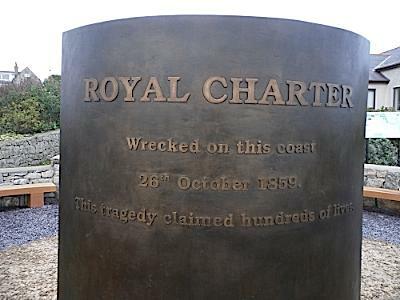 This is the brass plate commemoration of the ROYAL CHARTER DISASTER. 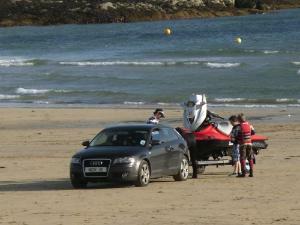 Don’t feel that you need to bring absolutely everything with you in the car when you come to Anglesey. Just bring yourself. Everything you need for your visit you can buy locally. Support small local businesses and enhance your contribution. 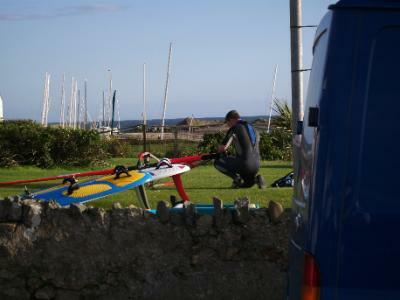 Click Here for Moelfre Facilities. Click Here for Benllech Facilities. If you want to amuse yourself, then stand back form the old lifeboat station on a sunny day and watch the novices cast and strike each other. If you've got any ambition then you'll head for the ledges marks opposite Moelfre Island near the wreck of the Hindlea. There are excellent marks along the coastal path to the north of the village. As good a spot as any lies in front of the Royal Charter monument. Early to late Spring is a good time for mackerel bashing, that is, if you don't mind competing with the odd seal or pod of dolphins and porpoises. Take bets with each other on who can strike and get the fish to shore intact. Can be a good place for fish heads and choral expletives. 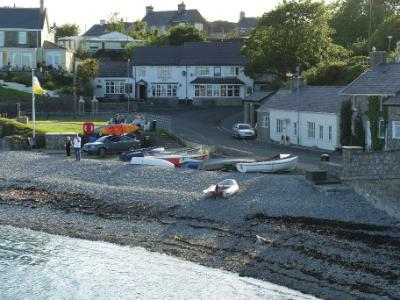 Moelfre presents itself as an ideal centre for walking the coast, visiting the RNLI Centre, fishing, enjoying a meal and a pint, or tea and a cake. Surfing, Windsurfing and Kite-Surfing are not on the agenda here. Enjoy this seaside village for what it is: just a delightful little village and a fabulous coastal path. Either, head a few miles down south to LLIGWY BEACH for excellent conditions when the NW or NE have been blowing for a few days. Or, you can head North a few miles to TRAETH BYCHAN. RHOSNEIGR and TREARDDUR BAY - are not favourable, then head for the opposite coast. Both beaches have excellent reputations and receive glowing reports. Lligwy Beach can be wild and fantastic for the skilled. 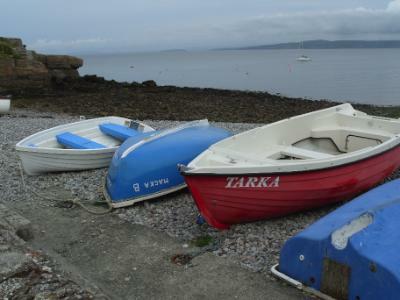 The coastline around Moelfre is shelved low cliffs, ideal for fishing but impossible to launch anything other than rowing boats. You'll undoubtedly notice the number of sailing boats, jet-skis and power boats playing up and down this pleasant coastline. So from where do they launch? Down the coast between Benllech and Moelfre is Traeth Bychan. 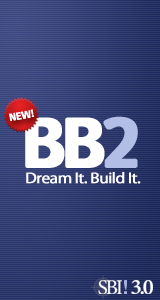 It is here that you can launch your craft. The County Council requires you to register powerboats over a certain horse power and also lists the required qualifications. Please CLICK HERE for all the above information and about launching fees on other Anglesey beaches and slipways. • No major prohibition on dogs at Moelfre, but please keep them on a leash - Unlike Crazy Fido here. • However, there are Seasonal Prohibitions on dogs on certain Anglesey beaches. • Always bring a doggie poo-bag with you because the little dears can't always help themselves. Imagine specific matter oozing from between your tanning and sandy toes. Imagine a worse scenario; it’s your child. 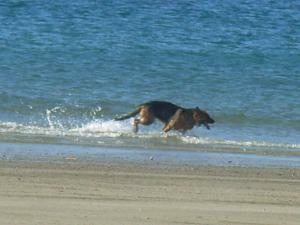 • The main concern regarding dogs on Anglesey beaches is a health issue. Doggie poo can blind for life. FOR MORE INFORMATION ABOUT DOG RESTRICTIONS ON ANGLESEY BEACHES PLEASE CLICK HERE. Travel north from Benllech for about three miles on the A5025 coast road. Turn right at the obvious large roundabout decorated with a large anchor as a centrepiece. Follow the road down into the village. Turn down to you right at the village shop on the corner and drive down to the beach. There is a very small car park overlooking the beach. There is usually plenty of kerb-side parking on the road down to the above beach turning. 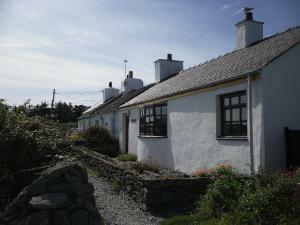 I would love to hear from you about your stay in Moelfre and Anglesey. 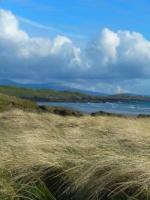 Especially if you enjoyed the Anglesey Coastal Path and a walk up and down the coast. Maybe you have questions that you want to ask before you get here. 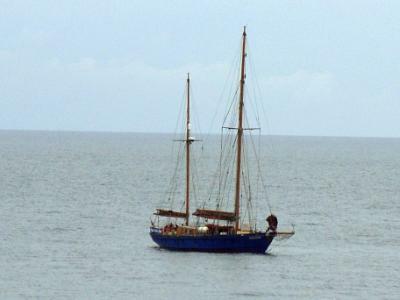 Maybe you are one of those visitors who has been visiting Anglesey for decades. Please tell me what makes Moelfre a really special place for you. Maybe you have special advice - or even warnings. Please feel free to share filling in the form below. Visit Llanallgo Royal Charter Church. More about The Royal Charter Disaster. Return from Moelfre to ANGLESEY EASTERN BEACHES.